Yellowstone West Thumb Basin is one of my favorite areas in this huge national park. 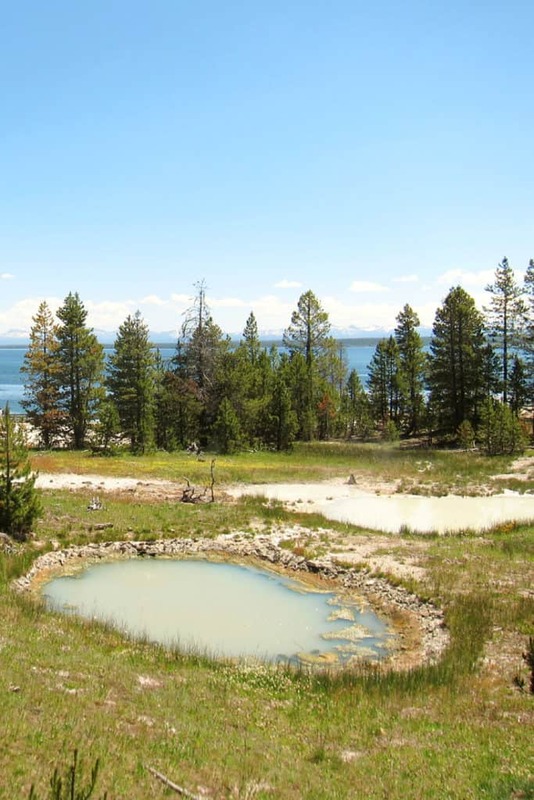 I love the combination of the huge cool clear lake and the active geothermal basin right by its shores. We visited the place three times already, once in the early summer of 2011 and twice again in the summer of 2013. 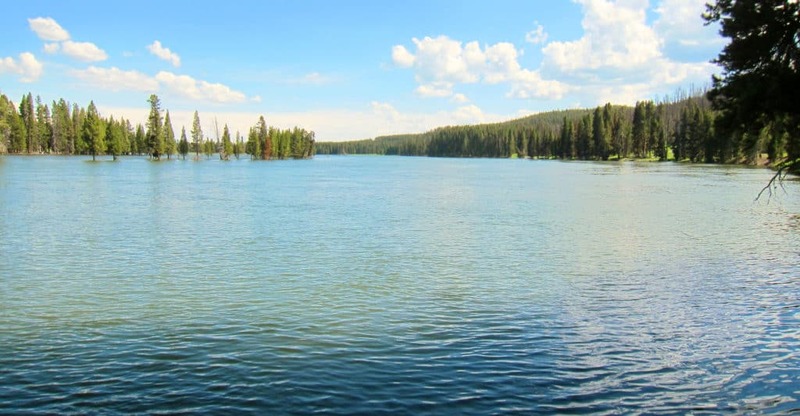 Time to share some Yellowstone eye candy from our trips, along with some tips about how to make the most of your visit to the area. Yellowstone is awesome. Literally, it fills your heart with awe and wonder. 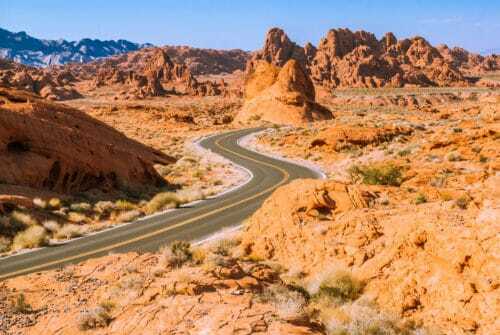 Whenever we visited the park, I felt immensely grateful for the privilege to see such an amazing place, where primordial geological phenomena take place right in front of your eyes. 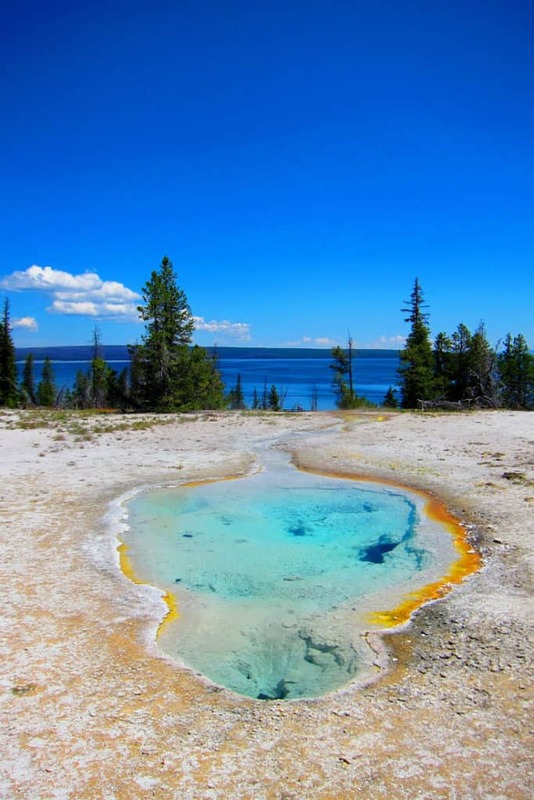 There are several geothermal basins in Yellowstone, each with its own unique features. 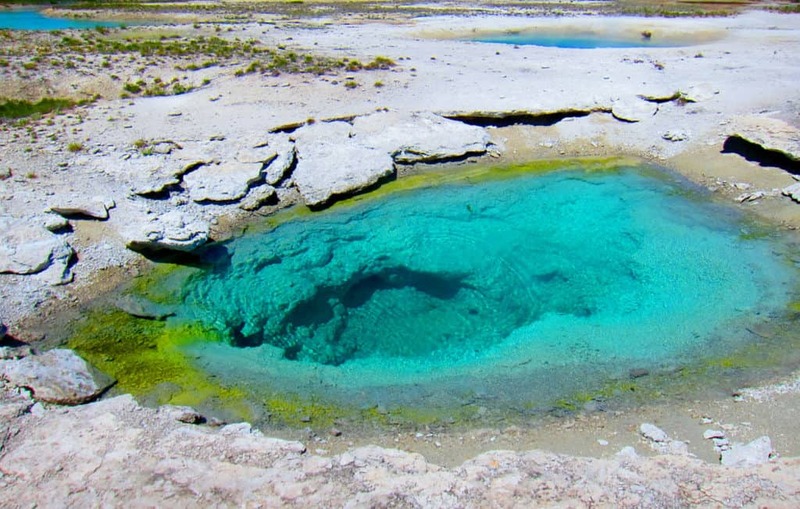 The West Thumb Basin is one of the best places to see beautiful hydrothermal pools, “paint pot” pools, fumaroles and bubbling mud. 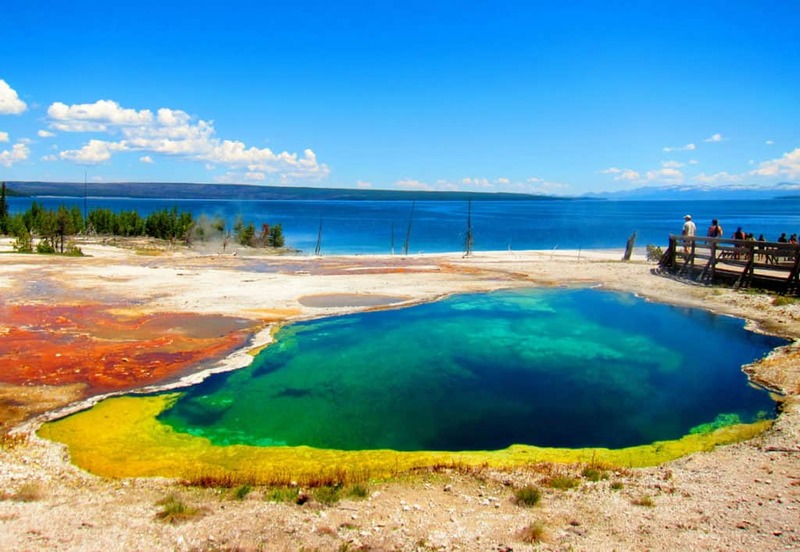 Most importantly, you’ll have the deep cool blue of Yellowstone Lake framing these colorful hot spots. 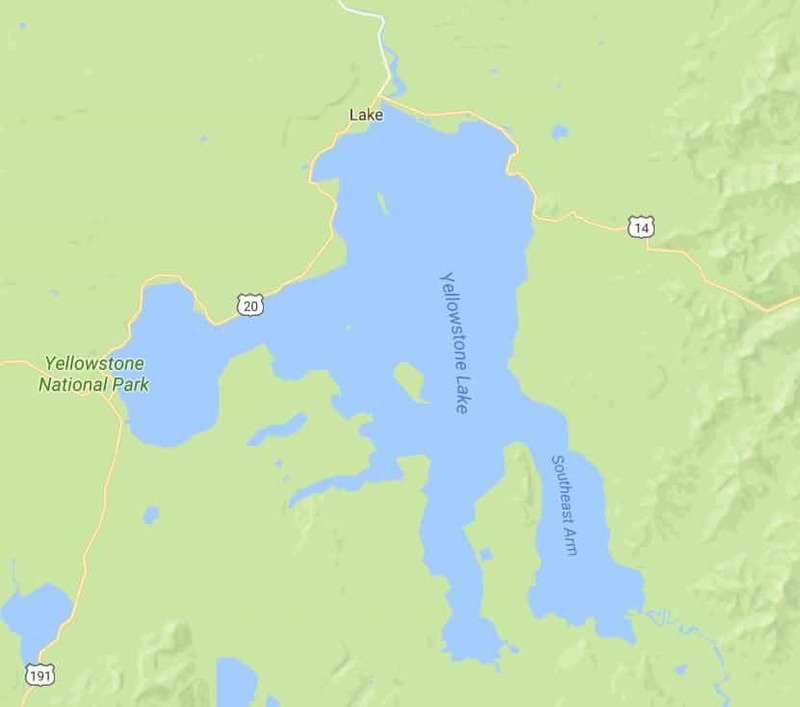 Why is it called the West Thumb Basin? The various arms are like the hand’s fingers. In the same line, the area sticking out to the west, the “west thumb”. 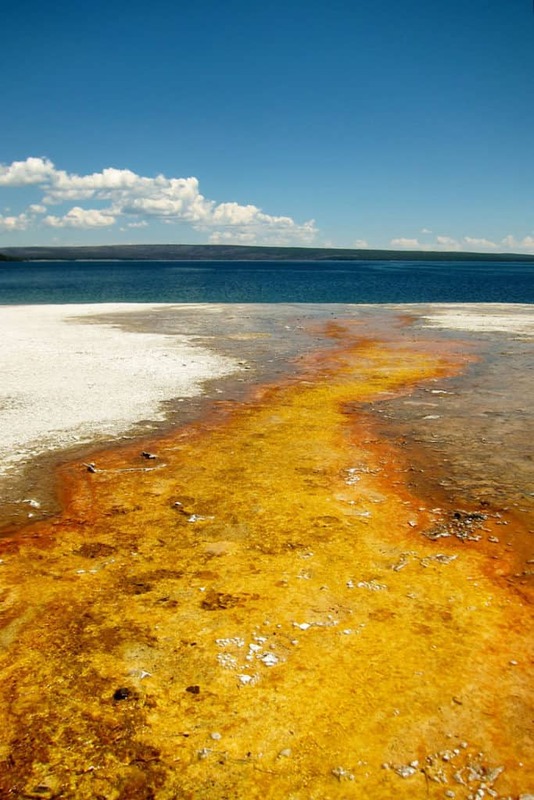 What to do when visiting the West Thumb Geyser Basin? 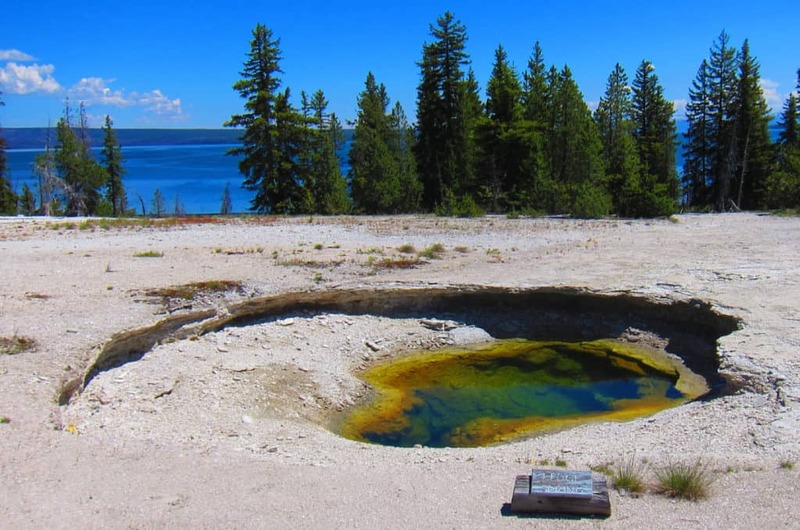 Park your car by the visitors center and let the clearly-marked West Thumb Geyser Basin Trail take you through the various pools and points of interest. This is a loop trail, most of it elevated above the ground. Stay on the trail and make sure your kids do as well. It really isn’t safe to wander off trails in this park. 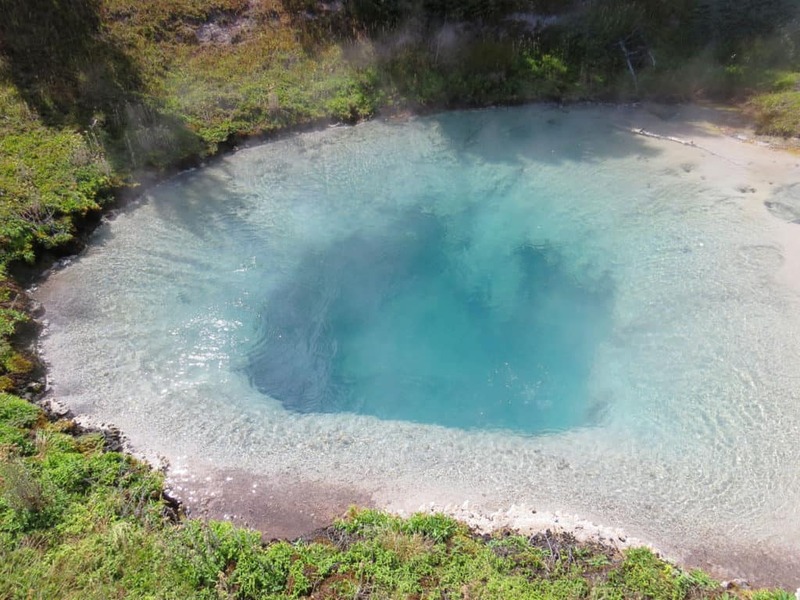 Hot pools – some of them hidden from sight under a crust of thin earth – can get up to 200 fahrenheit or 93 celsius! It’s 53 feet deep which means there’s a variety of color as the water gets deeper, hotter, and less likely to support the colorful algae. Fishing cone doesn’t look too impressive in this picture, I know. That’s because I photographed it in early July after a very wet year. 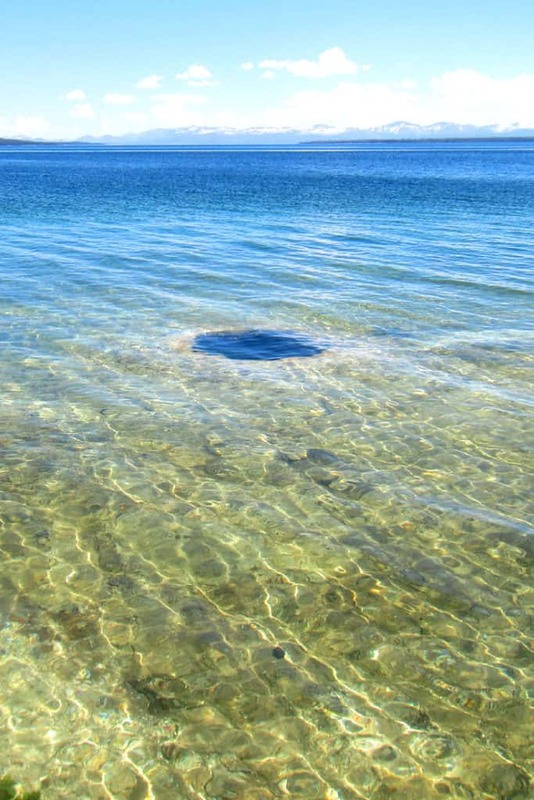 Yellowstone Lake was full of water and poor Fishing Cone was fully covered, as it often is during spring. 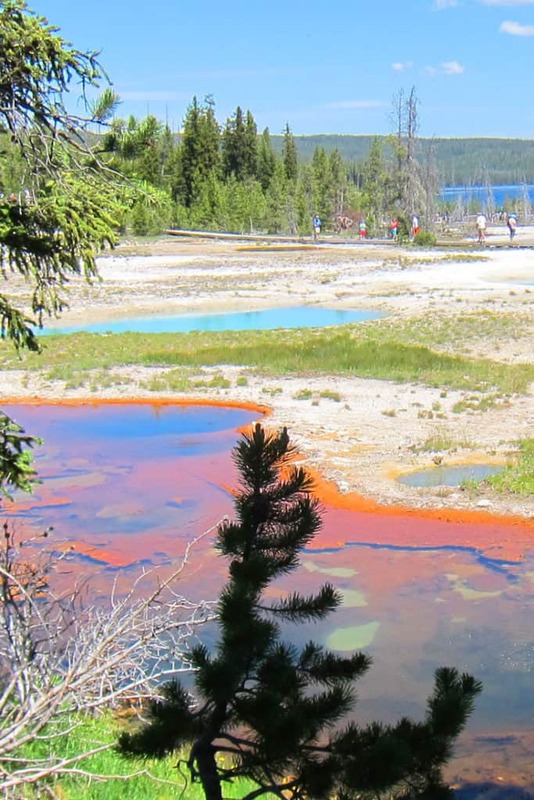 Hard to believe this used to be an active geyser! Don’t bring any fish to boil – Fishing Cone gets covered in cold water so often that it’s cooled down and no longer erupts. 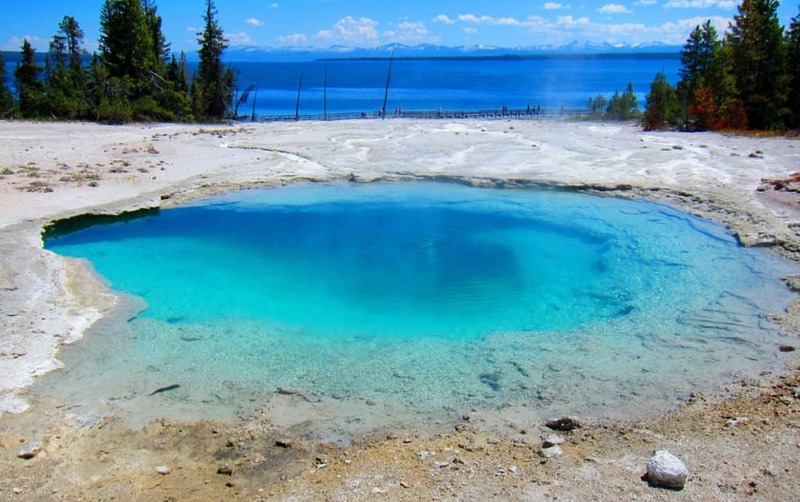 What geysers can you see at West Thumb Geyser Basin? 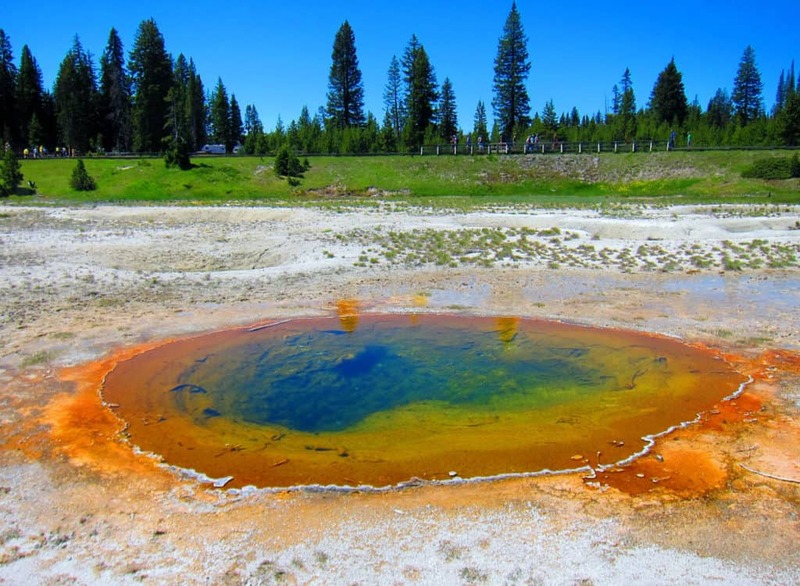 Don’t come to this basin expecting to see anything like Old Faithful. 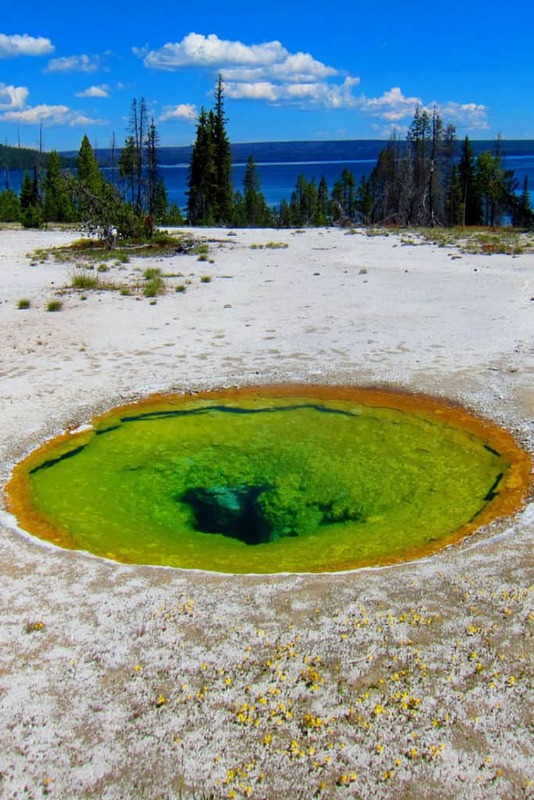 While this is called a geyser basin, we never saw any actual eruption. 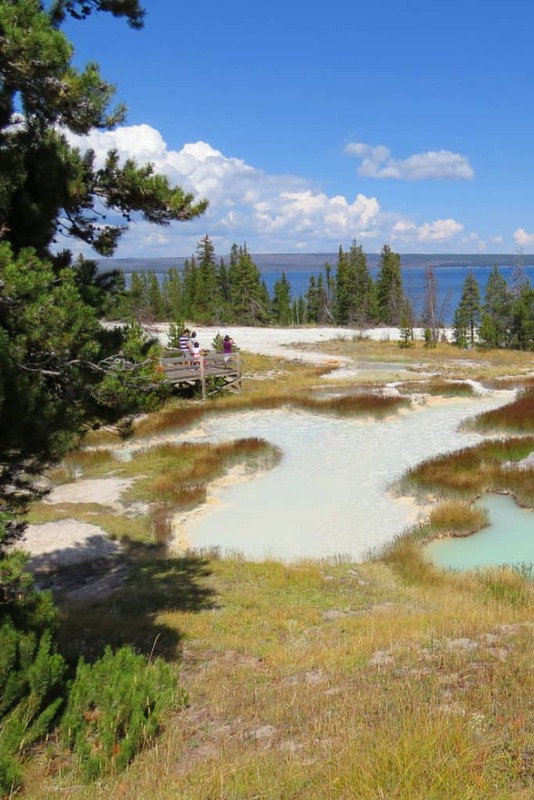 You will see bubbling mud pools at the Paint Pots area and the hot pools have their occasional bubbles and cauldron effects. 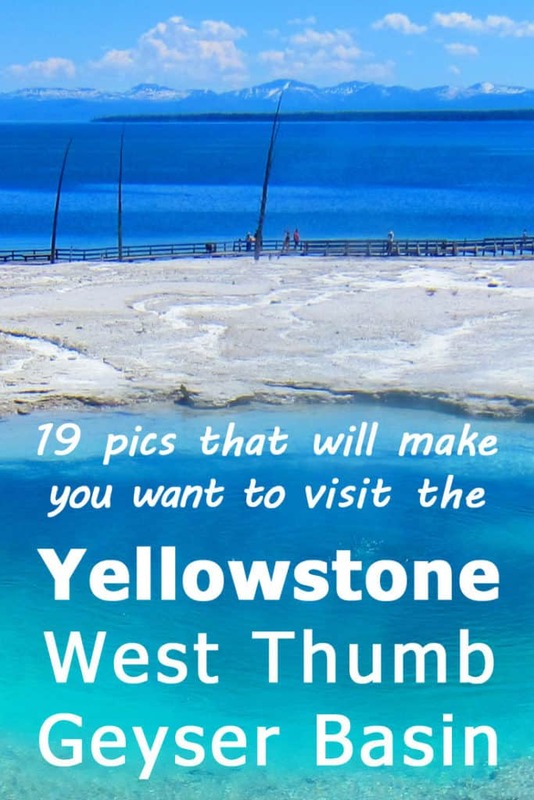 What else to do at West Thumb Geyser Basin? Go hiking! 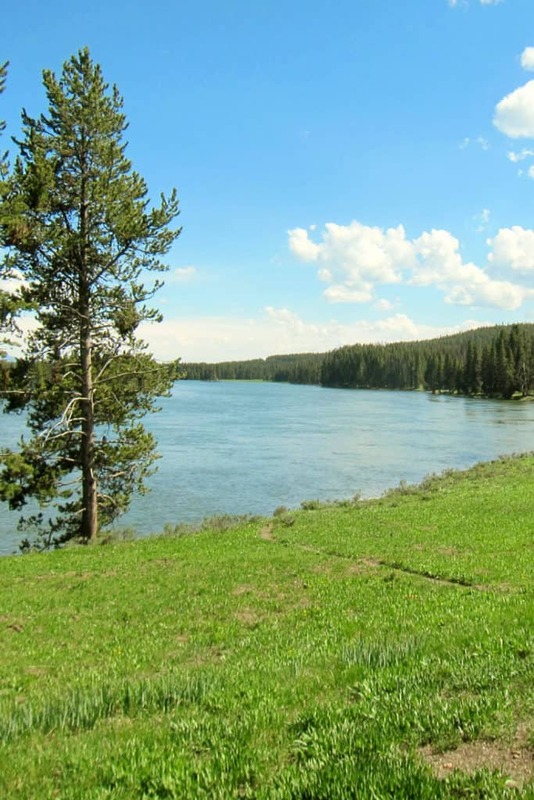 The trail in the basin is about a mile long but there are several great trails nearby. This is a beautiful area of the lake. The shape of the lake there means you have a direct line of sight to the mountains in the distance as well, as to the closer shores opposite you. It’s just very pretty. 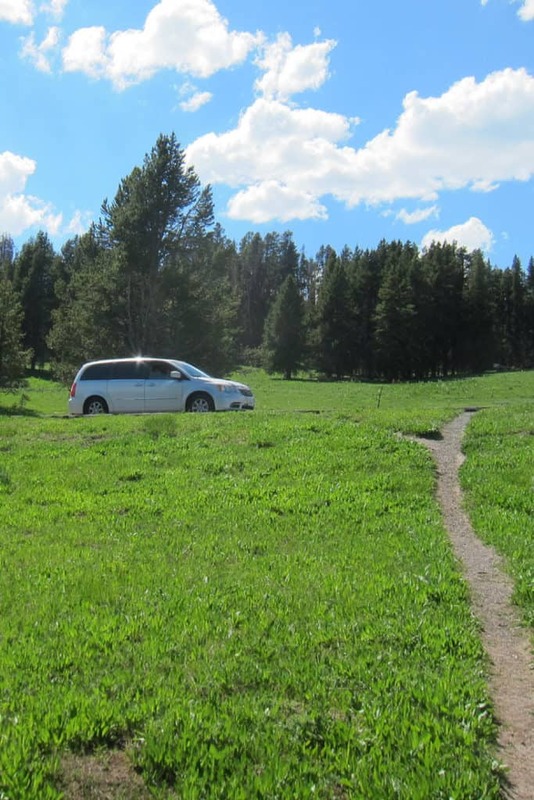 The lodgepole forest and the grass are quite welcoming for a stroll or a more strenuous hike. Please don’t forget to ask the rangers before going on the trail, or at least look for any warnings and notices. Grizzly bears forage for berries here during fall so the rangers sometimes close this trail and others. 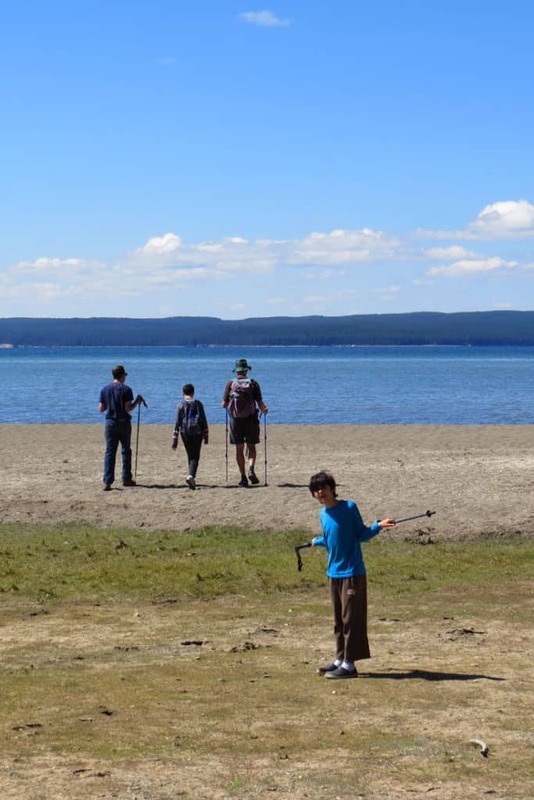 If you can, join a ranger-led activity in the area, especially if you’re traveling with kids and they’re on a mission to get the Yellowstone Jr. Ranger patch. 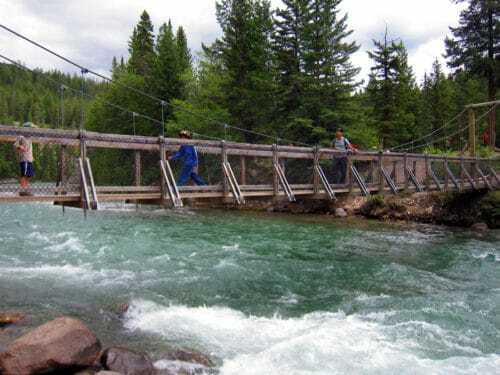 Here are more ideas on how to make the most of your visit to any National Park – most can be applied while visiting Yellowstone as well. 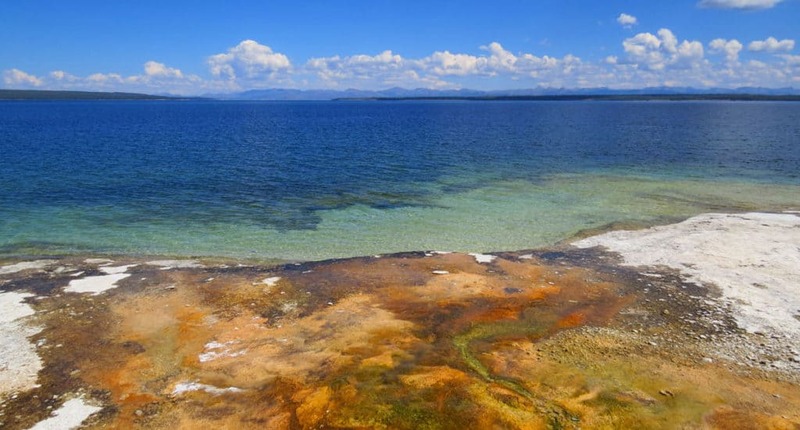 Even more pictures of Yellowstone’s West Thumb Basin! This post is all about eye candy, after all! So, I’ll leave you with more photos taken during our visits. 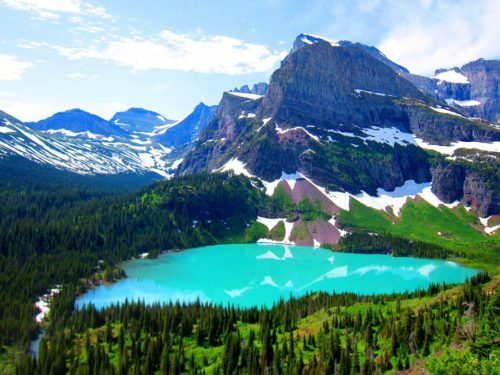 If you haven’t visited this amazing spot in the park yet, I hope these will make you add it to your Bucket List! Questions? Comments? Let me know what you think! Beautiful pictures!!! Lovely article- thank you!! So glad you like it – I hope you visited there – or will get to visit sometime! Danger! This number is absolutely wrong. 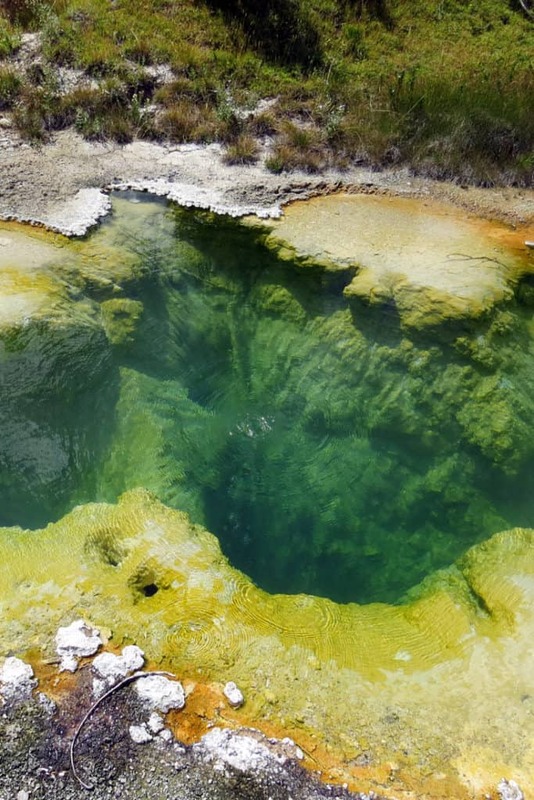 The water temperature is around 200 degrees Fahrenheit. This is scalding, near boiling. This is around 93 degrees centigrade. Thanks for the comment and you’re absolutely right of course. I had meant that to be 93 celsius which is far less inviting than 93 fahrenheit! That’s for being so vigilant and taking the time to send in your comment. I just made the correction.